I am delighted to welcome Mr. Izzy Bonilla into the Telcom & Data family. Telcom & Data Inc. is ecstatic to announce Mr. Ismael Bonilla as the new Business Development Officer for Transportation/Energy Security and Safety Markets. 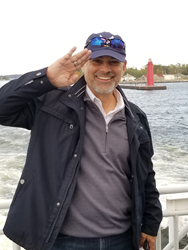 Mr. Bonilla recently served as the Airport Director for General Mitchell International Airport in Milwaukee before working for Telcom & Data Inc.
“I am delighted to welcome Mr. Izzy Bonilla into the Telcom & Data family. His wealth of experience in all areas of security, emergency notification and life safety will be instrumental in working with our customers to take Telcom & Data to the next level as well as driving additional shareholder value. We are looking forward to him expanding our rapidly growing airports and transportation markets,” said Ricardo Trinidad, Owner and CEO. Mr. Bonilla has worked with Aerostar Airports holdings in San Juan, Puerto Rico as Chief Operating Officer from 2013 to 2015, and as Deputy Director at Ft. Lauderdale International Airport from 2010 to 2013. He has also worked extensively with the Jacksonville Aviation Authority. Bonilla is a United States Air Force veteran who served over twenty years of active duty, retiring with honors in 1997. He holds a Masters Degree in Aviation Safety from Central Missouri State University, and a Bachelor of Science in Aviation Management from Embry-Riddle Aeronautical University. Bonilla is an active volunteer and serves as a Second Lieutenant with the Civil Air Patrol an Auxiliary Wing of the USAF. He is fluent in English, Spanish and Italian.